We offer various versions of JUGS radar guns with different types of display. Our standard kit is the JUGS SI Radar Gun with data lead which is connected to a 3-digit LED Readout Display with high visibility 7" numbers. The display and radar gun are powered from a rechargeable battery pack which is supplied with a separate automatic smart battery charger. The radar gun is operated in continuous mode and will automatically sense a moving ball or other similar object both away from and towards the gun. Two versions of the gun are generally available for speed readings in either km/h or mph. The range of speeds detectable are between 20 and 125 mph with an accuracy of plus or minus 1/2 mile per hour. The radar gun is supplied with a tuning fork to confirm callibration before use. 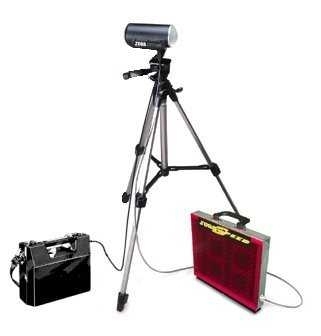 The radar speed kit also includes a tripod for mounting the radar gun. The JUGS SI radar gun has an LCD readout on the back so that it can be used without being connected to the large readout display. Contact us for details of pricing and delivery times or if you have any other questions.